The Pathway Viewer is a secure online tool which shows the patient pathways from diagnosis to treatment for cancer patients in the NHS. 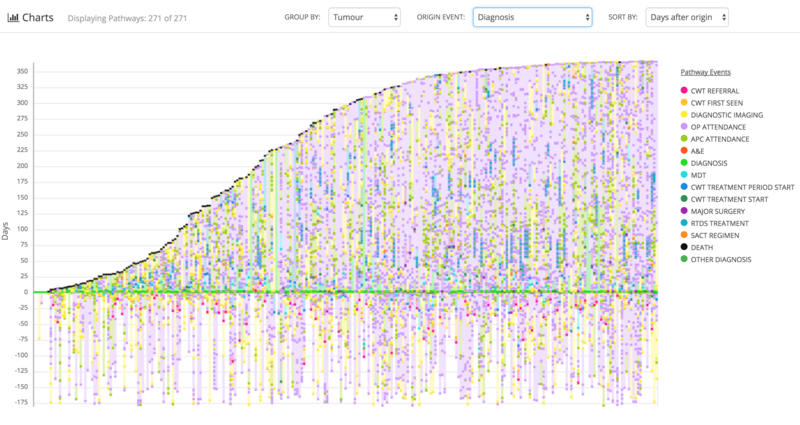 The Pathway Viewer is used by staff in the National Cancer Registration and Analysis Service (NCRAS) and clinicians and managers in the NHS to analyse cohorts of cancer patients, highlighting variations in clinical performance and outcomes. The Pathway Viewer provides a number of views of the flow of patients through the diagnosis and treatment pathways. Sankey charts show the overall structure of patient referrals within NHS hospital trusts and Cancer Alliances. Individual patient pathways are shown as timelines of medical events. The Pathway Viewer was developed by HDI in collaboration with clinicians at Univerisity College London Hospital (UCLH). The project started as two pilot projects focused on prostate and lung cancer. The pilot work lead to the development of specific views of the data which enables clinicians to understand cancer patient pathways within NHS hospital trusts and by Multi-Disciplinary Teams (MDTs). The underlying pathway data is brought together from a number of data sources available to the NCRAS, including: Cancer Wait Times (CWT), Hospital Episode Statistics (HES), Systemic Anti-Cancer Therapy (SACT), Radiotherapy Dataset (RTDS), Diagnositcs Imaging Dataset (DIDs) and Cancer Outcomes and Services Dataset (COSD), as well as the tumour level data generated by NCRAS.